Matt was born and raised in St. Louis and attended Saint Louis University where he graduated with a Master of Physical Therapy in December 2007. Matt has 9 years of outpatient orthopedic physical therapy experience. 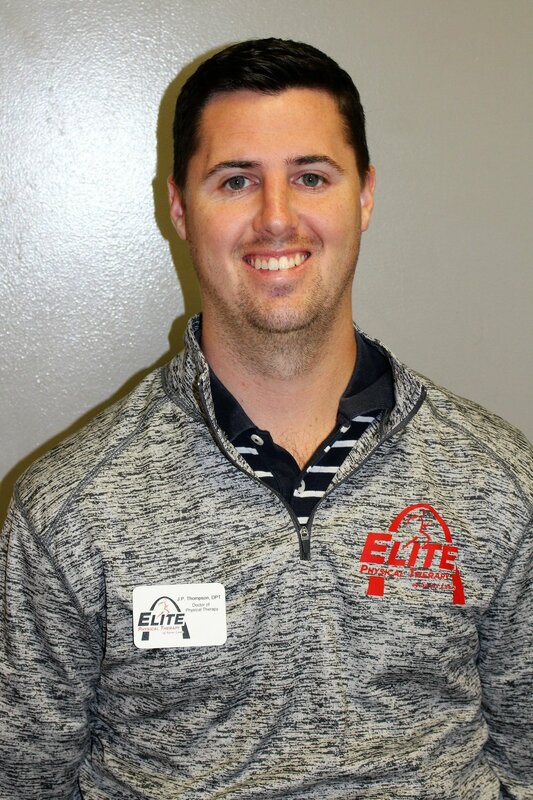 He worked in Ballwin for Scott Schuessler, DPT for 4 years before deciding to open a new Elite Physical Therapy of St. Louis in Creve Coeur as Co-Owner and Clinic Manager December 2015. Matt has extensive experience in treating patients of all ages with orthopedic diagnoses from pre surgical to post surgical and surgical prevention. He specializes in shoulder injuries and knee injuries and has worked with all types of patients, from those who have never picked up a weight or exercised to a world record athletes. Matt enjoys playing recreational football, basketball, softball and golf in his free time. Julie was born and raised in St. Louis and went to undergraduate and graduate school at Clarke College in Dubuque, Iowa graduating in 2002 with her Master of Science in Physical Therapy. Julie became a Certified Athletic Trainer in 2003 and achieved her certification as a Strength and Conditioning Specialist in 2004. In college, Julie was a muti-sport athlete playing tennis, softball and soccer. She was inducted into Clarke College’s Hall of Fame in 2012 for her tennis career. Julie has 14 years of outpatient physical therapy experience. She started out treating patients with a wide variety of orthopedic diagnoses as well as working with the St. Louis SLAM women’s professional contact football team and other local sports teams and running groups. Julie really enjoys treating athletes of all kinds, and over the last 6 years she has devoted most of her practice to treating the endurance athlete. Her continuing education has been focused on evaluation and treatments of endurance athletes including runners (first time 5K to elite marathoners), cyclists, swimmers and triathletes. Julie specializes in treating hips, knees and ankles. Her treatment philosophy is simple: never tell an athlete they can’t do what they want to do, active rest is always possible! She also believes in working the whole kinetic chain when treating an injury. In her free time, Julie enjoys spending time with her family, especially outdoors hiking and traveling. She is also an endurance athlete and enjoys running marathons (23 so far) and half marathons (over 40). JP graduated from Westminster College in 2012 with a BA in Biology, and in 2016 he graduated from Washington University with his Doctor of Physical Therapy. JP is a St. Louis native and was born and raised in St. Louis County, now loves living in the City. He enjoys treating all types of patients, and especially likes working with athletes and patients with back pain. JP subscribes to a Movement Based philosophy for treating his patients. He looks at how each patient moves and works with the patient to correct the movement back to a normal and pain free pattern. At Westminster College, JP played and captained the Men’s soccer team. In his free time, JP enjoys watching, playing and coaching soccer for a local select youth team and spending time running around and playing with his dog, Trumpet. Lauren graduated from Highpoint University in North Carolina in 2010 with a BS in Exercise Science, and in 2013 she graduated from the University of Missouri with her Doctor of Physical Therapy. Lauren is a St. Louis native and played competitive soccer with local clubs such as JB Marine and Scott Gallagher and for Eureka High School. She continued her soccer career into college playing for Highpoint University. During Physical Therapy School at the University of Missouri, Lauren focused on Sports Medicine and Orthopedics, and had the unique opportunity to do one of her clinical rotations with Mizzou’s Department of Athletic Performance where she worked side by side with the strength and conditioning staff. Lauren achieved her certification as a Certified Strength and Conditioning Specialist in 2013. Lauren likes treating a variety of orthopedic injuries, and specializes in treating hips, knees and ankles and endurance athletes of all skill levels. Because Lauren has had 2 ACL repairs, she understands from a personal level the commitment injured athletes make with physical therapy rehab to return to their sport. She really enjoys helping her patients get back to the field, court, road or course. Lauren has attended several continuing education courses and her skill set includes running and jumping analysis, ASTYM and rehabilitation for the endurance athlete community. In her free time, Lauren loves spending time with her family and being active in the community from running to Crossfit to barre3 to yoga. She is an endurance athlete and has ran 4 marathons and 10 half marathons.